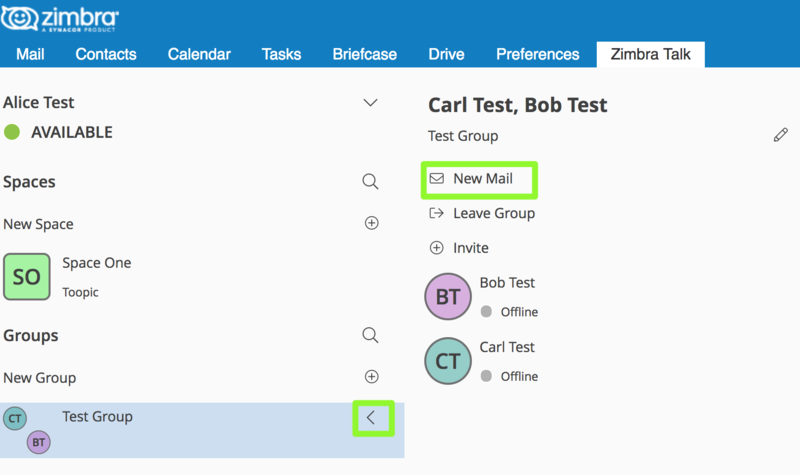 This article is applicable for Zimbra Collaboration Suite, Network Edition, v 8.8.8 and 8.8.9 only. NOTE: Beginning with v 8.8.10 this information has been integrated into the Zimbra Collaboration Administration Guide. The latest version is available here. 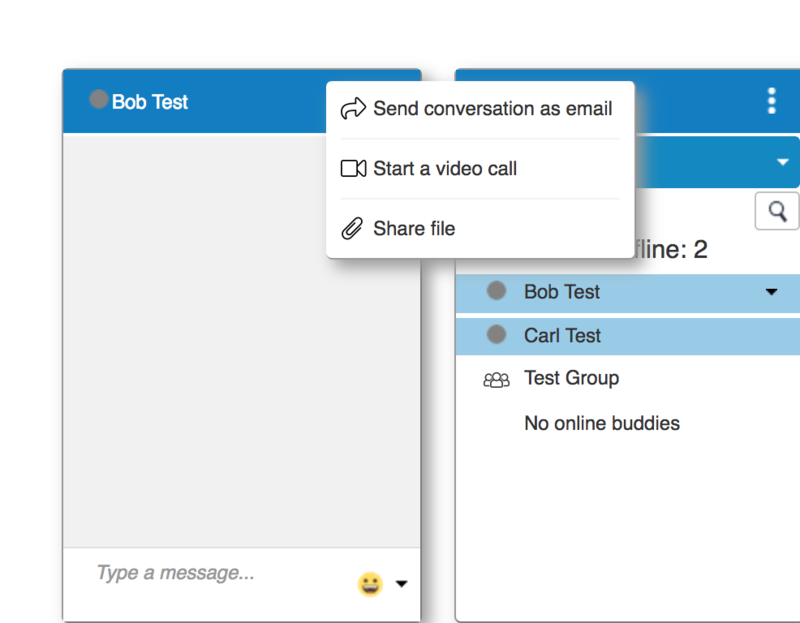 New in version 8.8.8, Zimbra Talk V2 integrates a fully fledged corporate instant messaging platform inside the Zimbra WebClient, including Group and Corporate Messaging, File Sharing, Screen Sharing and informal Videoconferencing capabilities. On a practical level, Talk v2 is both easier to use and to manage and provides more features to end users. No core installation needed. Zimlet installation through a package manager. Zimbra Talk v2 is licensed on a per-user basis. License information is included in the Network Edition license file just as for any other Zimbra NE feature. Its Advanced features can be enabled by Global Admins to any number of users up to the limit allowed by the license, and only «advanced» users count towards any licensing mean. Zimbra Chat and Zimbra Talk are not compatible and interoperable, meaning that the two products cannot freely coexist on any Zimbra NE infrastructure. The Zimbra Chat zimlet is uninstalled during the installation process of the Zimbra Talk Zimlet package. 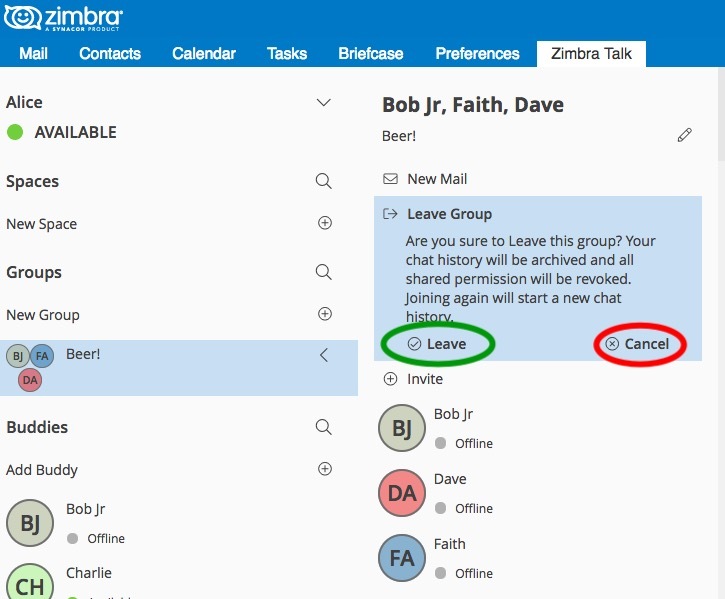 However, Zimbra Talk includes all «basic» IM features provided by Zimbra Chat which will be automatically enabled for all users who don’t have access to the «advanced» Zimbra Talk V2 features. «Advanced» users are able to use all of the product’s features with other «advanced» users and to use 1-to-1 Instant Messaging with «basic» users, while «Basic» users are allowed to use the basic 1-to-1 features with all other users. All users start off as «Basic» users, and the «Advanced» features can be enabled by Global and Delegated admins. The Zimbra Talk Zimlet is available in the Zimbra repository and can be easily installed and upgraded through the operating system's package manager. Installing the Zimlet will automatically remove any Zimbra Chat components from the server, as Zimbra Talk includes all the Zimbra Chat features. The mail-store node will need to be restarted for the zimlet to take effect! The same options can also be found in the «Global Settings» section of the Admin Console. 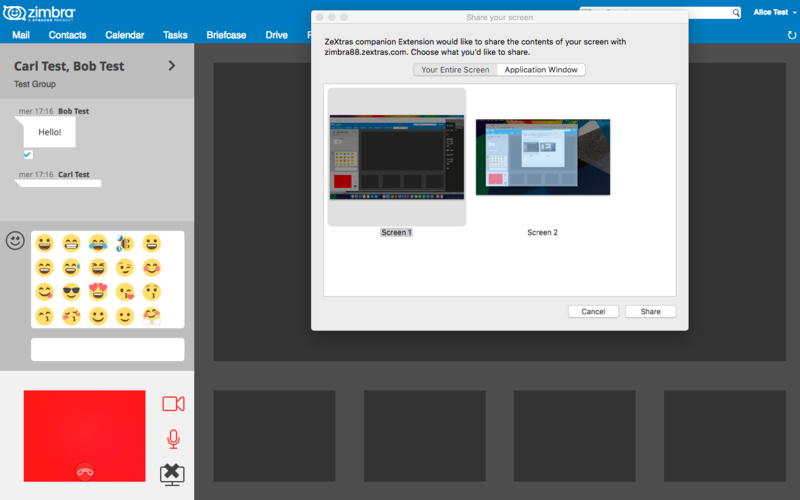 Google Chrome users must install the "Zextras Companion" extension in order to use the Screen Sharing feature, publicly available in the Chrome Web Store. Firefox users must be sure to be running at least version 52 of the browser in order to be able to use the Screen Sharing feature. 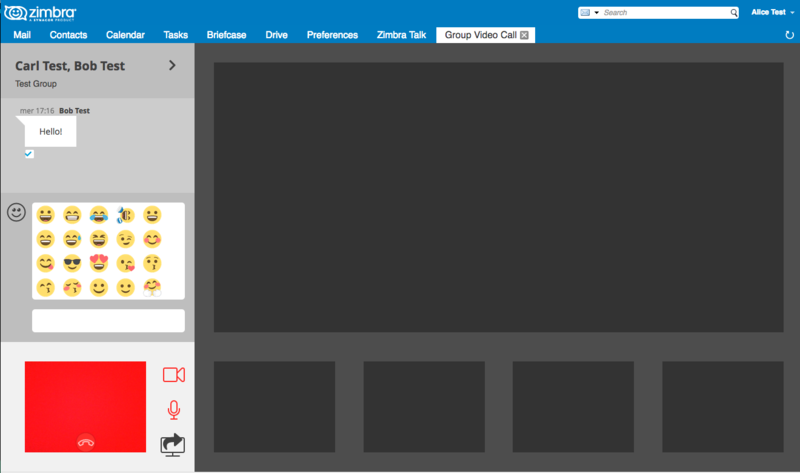 Zimbra Talk's UI is developed in REACT and seamlessly integrated with the Zimbra WebClient. It is composed of two client-side components: the IM Panel and the fully featured Talk Tab. 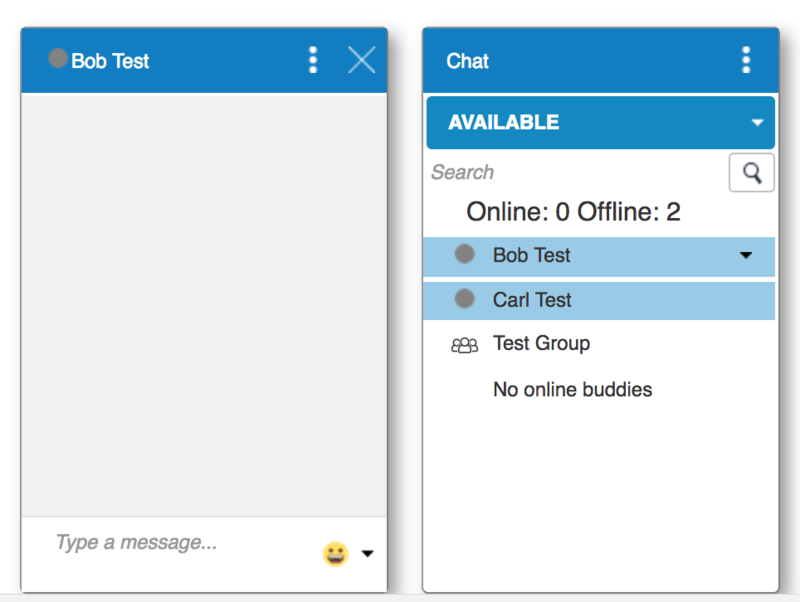 The IM Panel is inherited from Zimbra Chat and allows for quick Instant Messaging, both for 1-to-1 and group conversations. Advanced Talk V2 features such as File Sharing and Videoconferencing are available in the IM Pane only for users who have the Talk V2 feature set enabled either at account or COS level. This is available to both Basic and Advanced users. 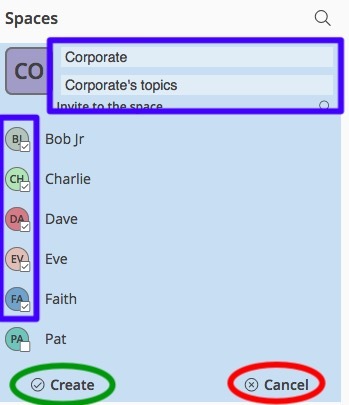 The Talk Tab is the full-sized Talk V2 UI, which contains all corporate instant messaging features such as Spaces and Channels. This is only available to Advanced users. 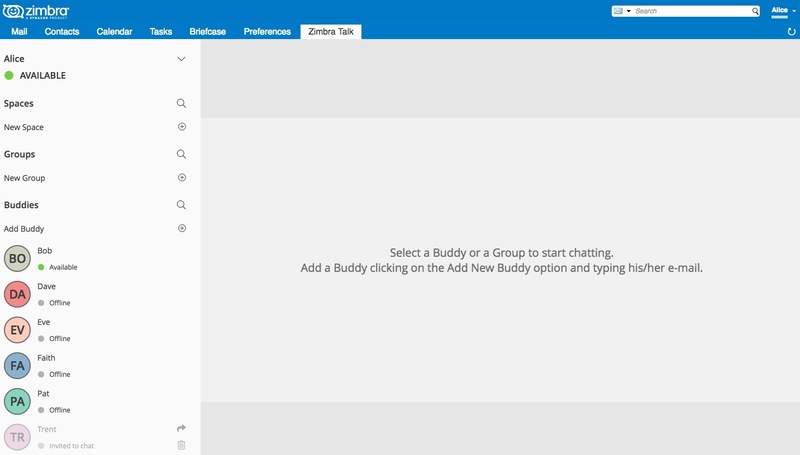 The IM Panel is inherited from Zimbra Chat and includes the very same features for "Basic" users as well as a few new additions for "Advanced" users, such as groups, file sharing and videoconferencing. Advanced features such as File Sharing and Videoconferencing can be found in the options menu on the top-right corner of the IM window. 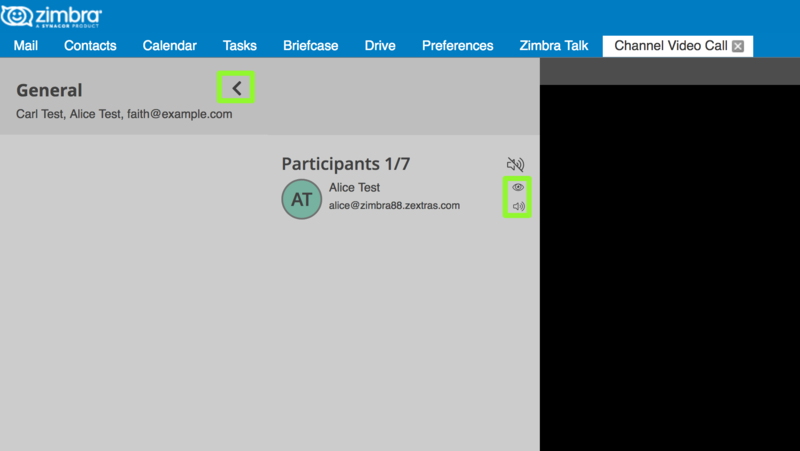 The Talk Tab is a fully fledged Zimbra feature tab that can be interacted with in the same way as all other feature tabs (e.g. Mail or Calendar). 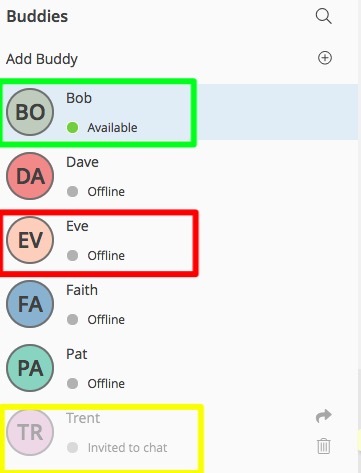 The same Buddy List and Conversations found in the IM Panel can be also found in the "Buddies" section of the Talk Tab. 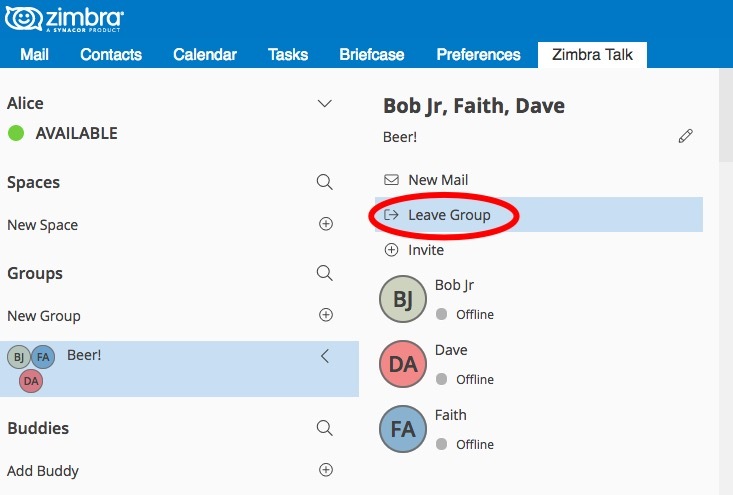 End users will be faced with three new "concepts" in Zimbra Talk v2: Groups, Spaces, and Channels. Groups are the basic way of communicating with multiple people at the same time (up to 5 total). 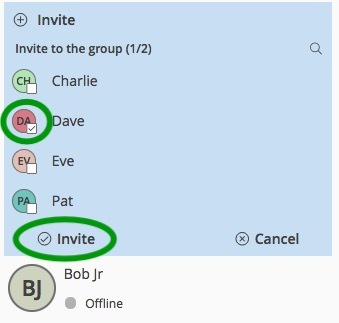 Those are non-persistent entities that are not tied to any specific space: any user can create a group inviting people from their Buddy List and any group member can invite more people in the same way. When all users leave a group, the group itself ceases to exist. A user in a Group can add more users to the Group itself up to the allowed limit. A user in a Group can chat with all of the others. Messages sent in a Group are viewed by all members of that Group. A user in a Group can send files to all of the others. Files sent in a Group are available to all members of that Group. A user in a Group can start a videoconference with all of the others. Group videoconferences can be joined at any time by all members of the Group. 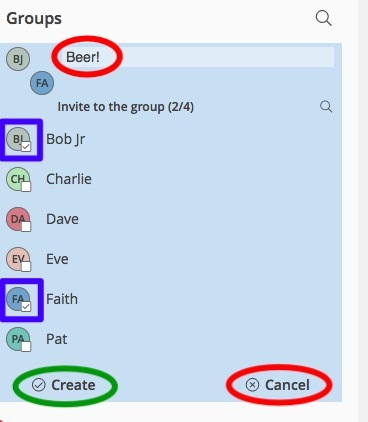 then, add the Group's title, select the buddies you wish to invite and click on "Create"
To invite one or more buddies to a Group, first expand the Group's options and click on "Invite"
then select the buddies you want to invite and click on "Invite" when done. To send an email to all members of a Group, click on the "New Mail" button in the Group's options. 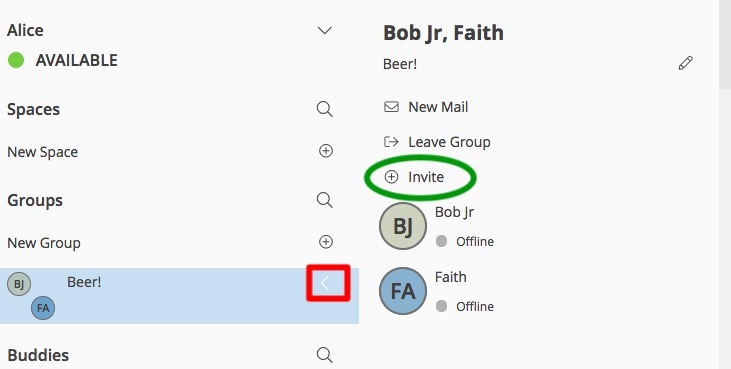 To send a file to all members of a group, click on the "paperclip" icon in the Group's chat window. Files sent to a group will be uploaded in a dedicated personal briefcase before being shared. To start a Group Videoconference, click on the "Camera" icon on the Group's chat window. 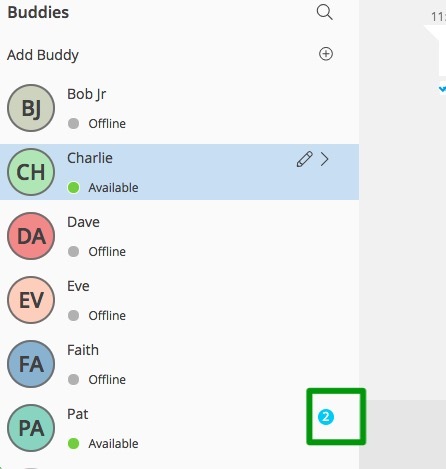 Any member of the Group can join the call at any time by clicking on the same button. then, click on "Leave" under the warning message. Spaces are a themed container that can hold any number of Channels. Think of a Space as a community center where people gather to discuss different topics in dedicated areas (named Channels). Each space has a unique name and topic. The name cannot be changed after creating the space while the Topic can be changed by clicking the "Edit" icon next to the topic itself. 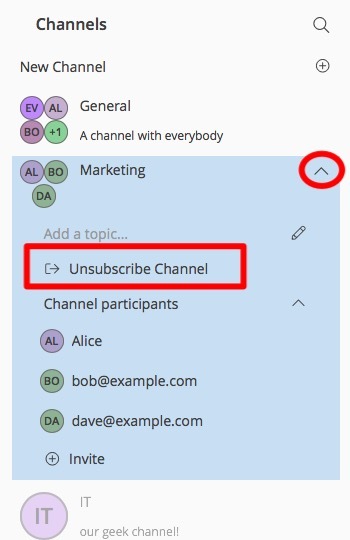 Users in a space can send an email to all members of that very same space by clicking on the "New Mail" button below the space's name and topic. Members can leave a space at any time by clicking the "Leave Space" button. 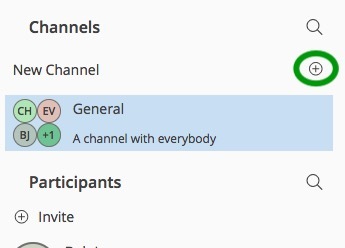 Members can create new channels and invite new people to the space using the appropriate buttons (respectively, "New Channel" and "Invite"). then, enter the Space's name and topic, select any buddies to invite and finally click on "Create". 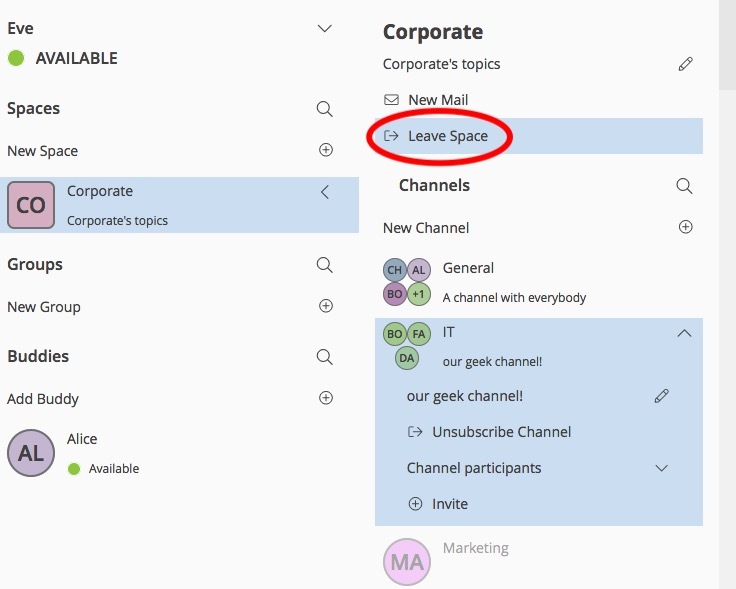 To send an email to all members of a Space, click on the "New Mail" button in the Space's options. To leave a Space, click on the "Leave Space" in the Space's properties. 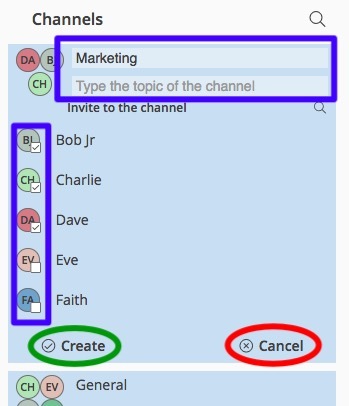 Channels are topic-defined areas inside of a same space. 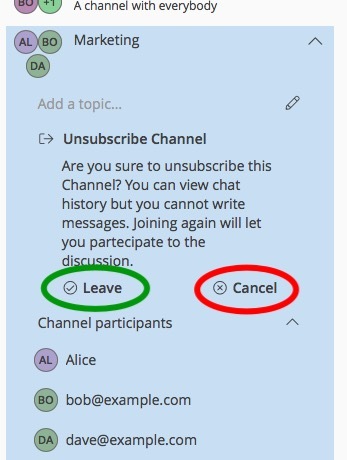 Those can contain any number of users, and unlike groups, users are able to autonomously join any Channel in a Space they are in instead of being invited to it by a member. Every time a new Space is created, a "General" channel is automatically created within it, which all users automatically join when they join the Space itself. A user in a Channel can chat with all of the others. Messages sent in a Channel are viewed by all members of that channel. A user in a Channel can send files to all of the others. Files sent in a Channel are available to all members of that channel. A user in a Channel can start a videoconference with all of the others. Channel videoconferences can be joined at any time by all members of the Channel. then, enter the Channel's name and topic, select any buddies to invite and finally click on "Create". 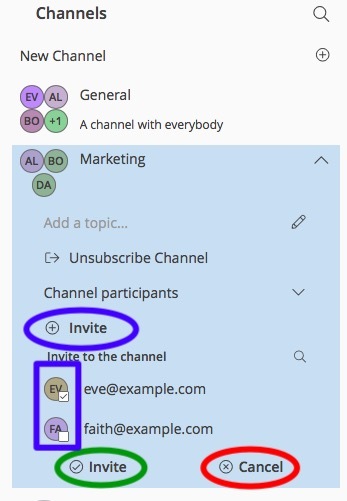 To join a Channel, click on the Channel itself and then on "Join Channel"
To invite one or more buddies to a Channel, click on the "Invite" button under "Channel Participants", select the buddies you wish to add and then click on "Invite"
To send a file to all members of a Channel, click on the "paperclip" icon in the Channel's chat window. Files sent to a Channel will be uploaded in a dedicated personal briefcase before being shared. To start a Channel Videoconference, click on the "Camera" icon on the Channel's chat window. 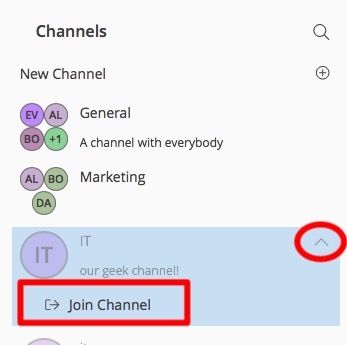 Any member of the Channel can join the call at any time by clicking on the same button. Videoconferencing features are available in both Groups and Channels, allowing multiple people to communicate in real-time using a webcam and a headset as well as allowing them to share their screen with all other attendees. This feature is based on the WebRTC protocol, a peer-to-peer auto-adaptive technology that allows clients to communicate directly without overloading the server and whose call quality is automatically tweaked based on the available bandwidth - with the maximum quality being Full HD for both video and audio. The first time a Videoconference is started, users will need to grant their browser access permissions to their camera and microphone. In the center, video streams are displayed with one main stream on the top and multiple secondary streams on the bottom, whose number depends on the screen's resolution and window size. On the top left, the Group's or Channel's instant messaging chat. This is visible and fully usable, and its history is saved in the group's or channel's chat history. On the bottom left, the user's own video feed and controls (disable video, mute microphone, and share screen). Users can disconnect from an ongoing Videoconference by pressing the "Hang up" button in their video stream's frame on the bottom left of the screen. 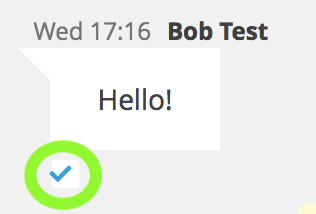 Whenever a videoconference is on, users belonging to the Group or Channel of the videoconference will see a "Call in progress" message below the name of the Group or Channel and will be able to join by clicking on the "Camera" icon in the chat. By default, video streams are displayed in a "first come, first served" basis according to the connection order between the peers. The "Eye" icon next to a participant's name will display or hide that participant's video stream. The "Sound" icon next to a participant's name will block the audio stream coming from that participant, effectively muting it for the user. The number of unread messages in any conversation, Group or Channel is always displayed on the top-right corner of the conversation, Group or Channel itself. Example of a message delivered to the server but not yet read by all recipients. Chat History for all 1-to-1 chats, groups, and channels is available in the very same window (e.g. enter a Channel to see all of that channel’s history) and messages delivered to offline users will appear in the appropriate IM conversation, group or Channel. Being WebRTC a peer-to-peer protocols, all users in a videoconference must be able to reach each other's client in order for the communication to be established. Should this not be possible, because of NAT rules on the network or because of a Service Provider's policy, using a TURN server will ensure proper communication between all peers. Zimbra Talk V2 is designed to allow using a STUN/TURN server out of the box by simply adding the TURN server's URL and login information in the zimlet configuration. Edit the list of ice servers which will be used to establish connections for video calls. Configuration available for global(default), cos or account. Multiple STUN and TURN servers can be added to handle different users or Classes of Service (defined through the `user` and `cos` optional parameters of the command above). On the STUN/TURN server side, having a single user and authenticating with their username and secret key is highly suggested for ease of use reasons, as a 1:1 correspondence between Zimbra users and TURN users is not necessary. Running a command without arguments will display the command's usage message. Running `zxsuite chat` without any command will display the list of available commands. iceServer - Edit the list of ice servers which will be used to establish connections for video calls. Configuration available for global(default), cos or account.